Bonyhád is the largest city in the hills of Völgység and belongs to the county of Tolna. 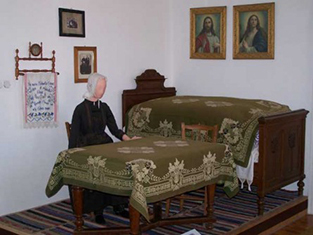 It has approximately 14.000 inhabitants and is located 40km northeast of Pécs. In the 18th century many German families settled in Bonyhád. Most of the colonist came from Hesse, which the city crest created in 1990 still reflects: in its upper third, it shows a silver and red lion with a doubled tail and an outstretched tongue on blue ground. The lion wears a golden crown and holds a sword in his right paw. Bonyhád is possibly the only borough, which shows the country of origin of their German inhabitants in that way. Under the crest, a red banner is inscribed with a Hungarian motto saying “With loyalty to our country“. 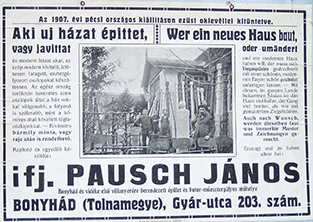 This reflects that Bonyhád was a place to which those Germans came who were willing to assimilate and who were against the German nationalist “Volksbund”. After World War II, many of them were disappointed that they too were considered traitors and were dispossessed. They were put into the same cattle wagons and displaced as the members of “Volksbund”. The deportation of Jews in 1944 and displacement of Germans affected approx. 3.500 inhabitants. Their houses were given to 300 families who were refugees from Bukovina and displaced Hungarians from Czechoslovakia. The most important monument in Bonyhád is the Roman-Catholic parish church on Szabadság tér. Construction was begun in 1769 and Count Esterházy, bishop of Pécs, consecrated it in 1782. The baroque church has one nave and was erected on initiative of the priest Michael Winkler. The families of Kliegl and Perczel organised the necessary material and protestant bondmen had to do compulsory labour on the construction site. Michael Winkler is commemorated in the church’s vestibule with a plate from 1931. Winkler had made an important discovery: in the bishop’s archive in Pécs he had found a perpetual calendar from the 16th century. It had been made by Franciscan monks and contains prayers, meditations, quotes from the bible and songs. This important document is nowadays kept in the Széchenyi library in Budapest. It has been named “Winkler Codex” after its discoverer. 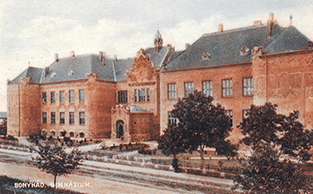 Protestant grammar school in Bonyhád, early 20th century. 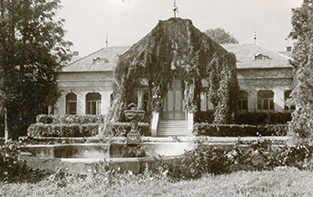 Palace of the noble family of Perczel in the 1940s. Today it holds a library. The Pausch family of Bonyhád produces the sculptured columns that are so popular with Germans of Hungary. Advertisement from 1907. April to September: Tue-Sat: 10 am – 4 pm, closed on Sundays and Mondays. October to March: Tue-Fr: 10 am - 4 pm, closed on Saturdays, Sundays and Mondays. The exhibition at the local museum “Völgység” shows folklore and history of the region from the early 18th to the mid-20th century. The exhibition can be visited upon previous notice or while choir practices on Tuesday after 5 pm. 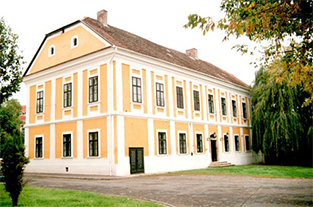 The heritage museum of Germans of Hungary was opened in 1992 with financial support of the state of Bavaria. It shows recreated living rooms and kitchen, as well as agricultural rooms around the house.